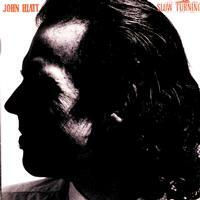 Slow Turning was singer-songwriter John Hiatt's ninth album, released August 30th 1988. It provided Hiatt's only significant radio hit with the title track, which features the memorable line "I'm yelling at the kids in the back, 'cause they're banging like Charlie Watts". The single "Slow Turning" was also featured in the 2002 motion picture drama The Rookie which starred Dennis Quaid. "Feels Like Rain" was later covered by Buddy Guy on an album of the same name and was featured in the 2004 Kate Hudson movie Raising Helen. "Drive South" became a country hit for Suzy Bogguss in the early 1990s. "Icy Blue Heart" was covered by Emmylou Harris in her 1989 album Bluebird, with backing vocals by Bonnie Raitt. Ilse DeLange recorded "It'll Come To You"" and "Feels Like Rain" on her live album "Dear John". During the barroom scene in the Film "Thelma and Louise", the band is playing "Tennessee Plates" (Charlie Sexton recorded the song for the soundtrack album). Though not credited on the album cover, Hiatt is backed by The Goners.